Imagine being able to predict market crashes by looking at the height of skyscrapers. Does this seem too far-fetched to you? Actually, the skyscraper index is one of the more robust indicators of economic downturns and crashing markets. And for good reason. The theory is simple: the construction of the next ‘tallest building in the world’ marks the end of a stock market peak. Today I will explain that reason and we’ll discuss whether the skyscraper-index is able to guide our investment decisions. Skyscrapers make headlines. People have been obsessed by tall buildings for ages. The ancient Bible tells the famous story of the Tower of Babel, which shows that people have been obsessed with building taller and taller since the beginning of times. And even I have to admit going to the top of every tallest building in all major cities around the world to enjoy the, more often than not, beautiful sights. A country’s national pride could depend on having the tallest building in the world. Countries try to outdo each other in a race to the top. In 1999 it was Andrew Lawrence, however, that showed how business cycles coincide with our obsession of building the world’s tallest building. The past hundred years have been a succession of recurring episodes of booms and busts. The causes of these booms and busts are monetary: an expansion of credit drives up certain prices — and lowers interest rates — that are conducive to building as high as possible. A lower interest rate leads to higher land prices and a lower cost of capital. The higher land prices results in a more intensive use of the space available: in short, higher land prices translate into taller buildings due to cost-efficiencies. The lower cost of capital makes projects with higher capital requirements more attractive than at a higher cost of capital, and building skyscrapers is a very capital intensive activity. The flow of money and credit explains for the most part the correlation between building big and market crashes. Low interest rates also provoke higher commodity prices, specifically higher gold prices. The Singer Building was the first in line to predict a stock market panic. The New York Stock Exchange collapsed over 50% in a year, all the while the Singer — the tallest building at that time —— was completed. The Panic of 1907 was one of the fiercest stock market crashes in the US. 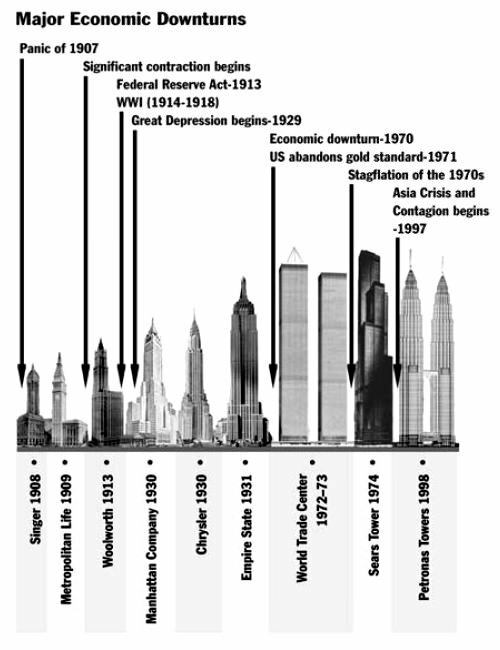 Later examples that set new records include a skyscraper in Manhattan (71 stories) in 1930, the Chrysler Building (77 stories) in again 1930, and the Empire State Building (102 stories) in 1931: all on the onset of America’s Great Depression. The World Trade Center — completed in 1973 —preceded the stagflation of the 1970s and, more specifically, the 1973-74 stock market crash and surging gold prices in that same decade of stagflation (economic stagnation combined with high inflation). In 2007, Dubai set a new record high by building the Burj Khalifa Tower. It was a clear danger signal of things to come a year later: the world fell into the severest recession, by many labelled the Great Recession, since the Great Depression. Even the euro crisis was preceded by a new skyscraper record: the Shard building in London, which reaches over 1,000 foot, was in construction when the euro crisis erupted. What Does the Skyscraper Index Predict Now? What does the skyscraper index predict next? Of course, no indicator is perfect. But many indicators have failed miserably in light of the greatest monetary experiment in the history of the world. The skyscraper index seems to be reasonably robust to guide our long-term investment decisions. There were two recent warning signals: one in the US with the One World Trade Center, which reached a record high, although many question whether the One World Trade Center can truly be regarded a new record: its height is achieved by the inclusion of a gigantic antenna. We might consider this cheating and exclude it from our index. More importantly, China announced it was planning to build the world’s tallest skyscraper in Changcha, called Sky City. If the project is completed, it will be 33 feet taller than the current record holder, the earlier mentioned Burj Khalifa. I’m convinced that the view on the 202th floor of Sky City will be magnificent. I also expect, nevertheless, another downturn and stock market crash in China and elsewhere. Gold prices seem to be the best alternative if and when the skyscraper index is correct in its next prediction, because gold prices as a rule move contrary to stock prices. Investors should therefore buy gold in anticipation of a stock market crash.